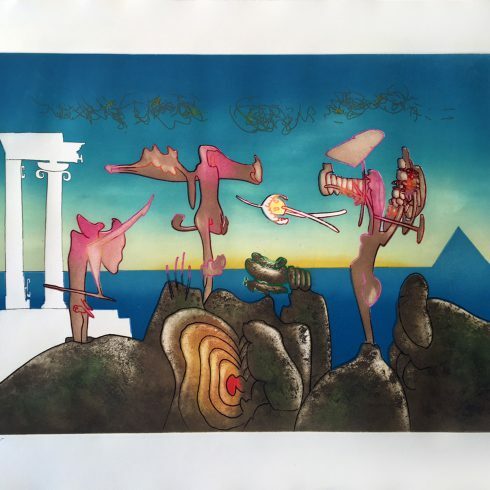 Chilean-born artist Roberto Matta was an international figure whose worldview represented a synthesis of European, American, and Latin American cultures. 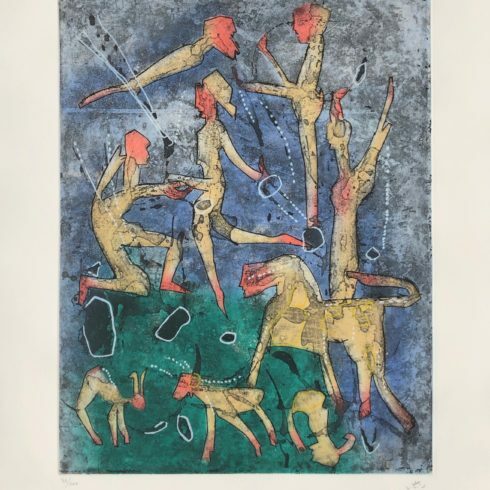 As a member of the Surrealistmovement and an early mentor to several Abstract Expressionists, Roberto Matta broke with both groups to pursue a highly personal artistic vision. His mature work blended abstraction, figuration, and multi-dimensional spaces into complex, cosmic landscapes. 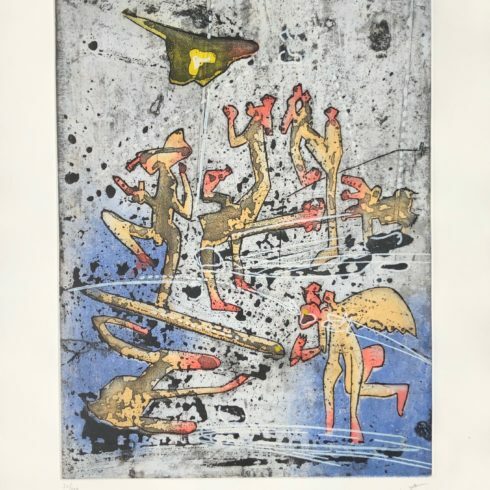 Roberto Matta is known for his unique blending of Surrealism with Abstract Expressionism. Like his friend Arshile Gorky, Roberto Matta’s otherworldly paintings and prints explored the unconscious through methods of Surrealist automatism. With fluid brushstrokes of rich color the artist described nebulous spaces inhabited by floating organic and architectonic forms, as seen in the hallmark work Les Roses sont belles (1951). “I am interested only in the unknown and I work for my own astonishment,” he once declared. 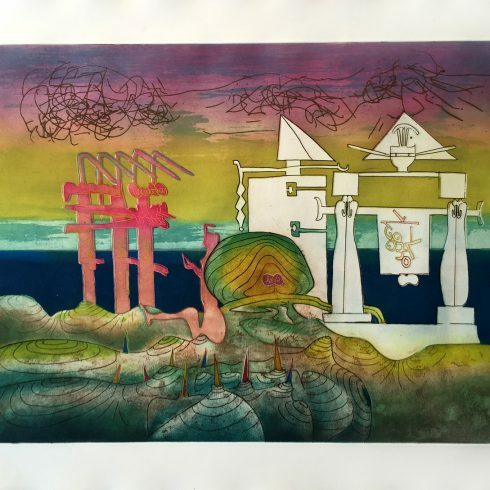 Our Fine Art Gallery has the finest quality Roberto Matta original prints, lithographs, etching, aquatints, and carborundum. We have a large inventory available off-site and we encourage you to make an appointment to see specific works you are looking to collect. We are happy to meet you at either our art gallery showroom or at your home or office for a private presentation. Roberto Antonio Sebastián Matta Echaurren was born on November 11, 1911 in Santiago, Chile. Matta was educated in his native country as an architect and interior designer at the Sacré Coeur Jesuit College and at the Catholic University of Santiago, from 1929-31. In 1933 he became a Merchant Marine which enabled him to leave Santiago and travel to Europe. From 1933-34 he worked in Paris at the atelier of famed architect Le Corbusier. At the end of 1934 Matta visited Spain, where he met the poet and playwright Federico García Lorca who introduced Matta to Salvador Dalí. 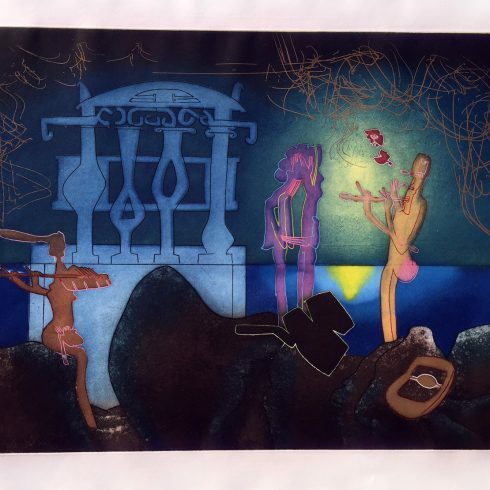 Dalí encouraged him to show some of his drawings to Surrealist leader Andre Breton. Matta’s acquaintance with Dalí and Breton strongly influenced his artistic formation and he officially joined the Surrealists in 1937. He was in London for a short period in 1936 and worked with Walter Gropius and László Moholy-Nagy. Matta’s employment with the architects of the Spanish Republican pavilion at the 1937 Paris International Exhibition exposed him to Picasso’s powerful painting ‘Guernica’ which greatly impressed him and influenced him in his own work. At this time, he was introduced to the work of Marcel Duchamp, whom he met soon after. He later went to Scandinavia where he met the architect Alvar Aalto and then to Russia where he worked on housing design projects. 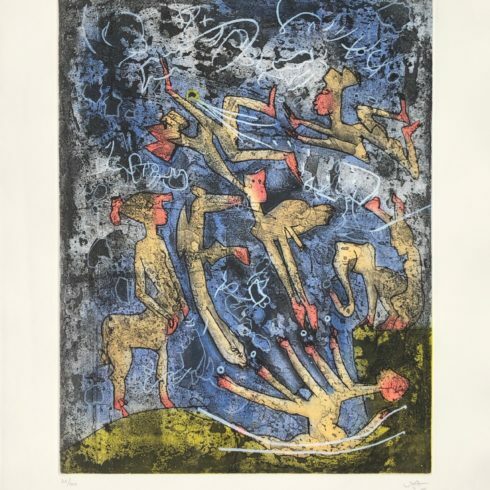 The summer of 1938 marked the evolution of Matta’s work from drawing to painting. He completed his first oil paintings while in Brittany and working with Gordon Onslow Ford. Forced to leave Europe with the outbreak of war, Matta arrived in New York City in the fall of 1938. 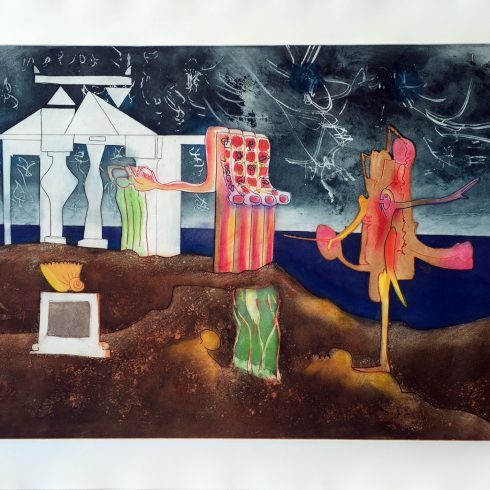 Consistent with his later works and with Surrealist theories of practice, Matta began his exploration of the visionary landscape of the subconscious using color to created energized forms and space. 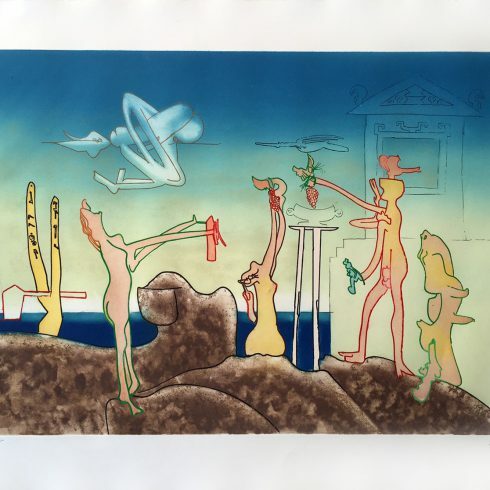 Matta looked to his friend and mentor Yves Tanguy whose works are reminiscent of 15th and 16th century Dutch artists such as Bosch or Bruegel. 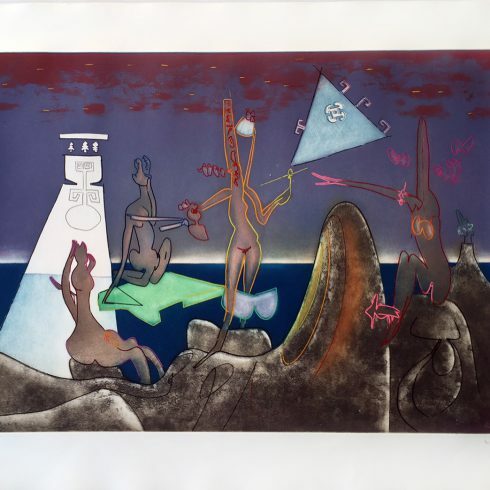 In addition, both Matta and Tanguy create a universe that is simultaneously fiery & chilly that is often connected to their own social consciousness of the ongoing war in Europe. Matta’s style and willing exploration of the surrealist philosophy of “automatic composition” heavily influenced the development of the New York Abstract Expressionist School and their exploration of Action painting. The 1940s also signified the re-entry of the human figure into his compositions creating a compositional dialogue of Man versus the Machine. 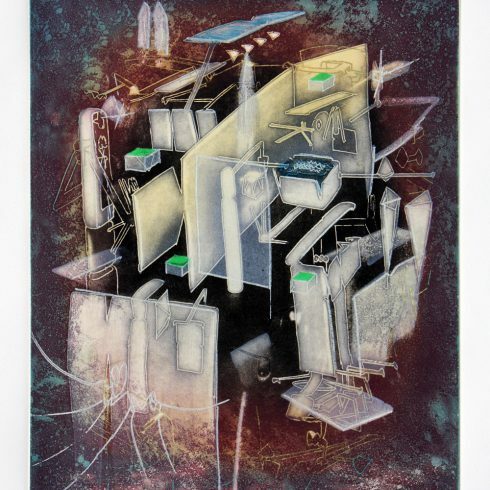 The forms he created were organic and existed in symbiotic relationships with machines. 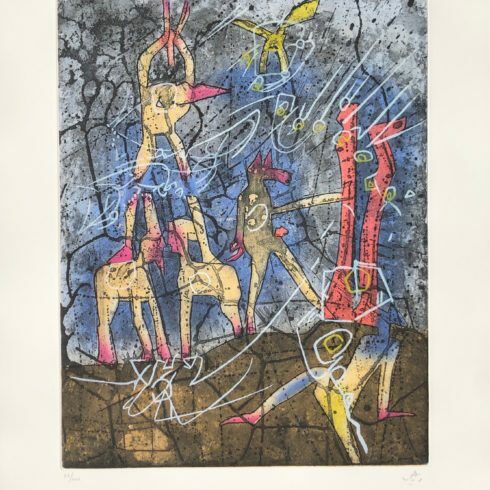 In 1947, Matta was expelled from the surrealists’ group, and he returned to Europe. By the 1950s & 60s he established homes in Rome, Paris, and London. He visited Cuba in the 1960s to work with art students. His work of the 1960s tended to have distinct political and spiritual intentions. Much of his work consisted of themes related to political events occurring in such places as Vietnam, Santo Domingo, and Alabama. 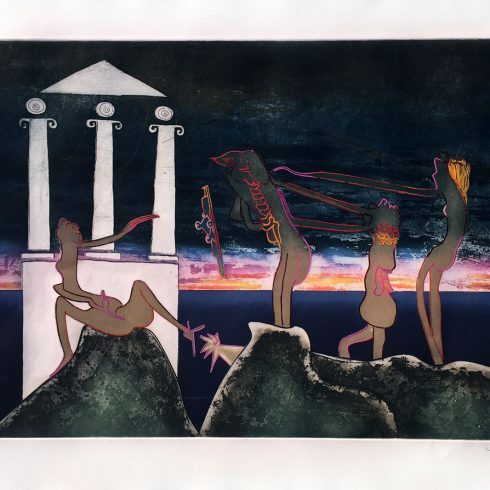 The 1960s marked not only a change in Matta’s themes, but in his style. He found influences in contemporary culture while remaining close to his Surrealist roots. The idea of automatism was a key element of the Surrealist movement, which emphasized the suppression of conscious control over a composition in order to give free reign to the unconscious imagery and associations. 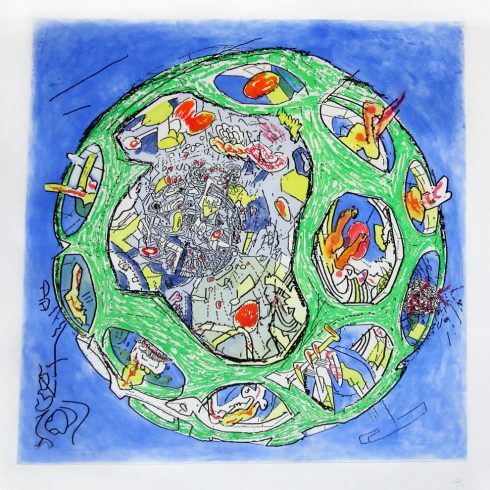 Matta used automatism in a manner that allowed one form to give rise to another until unification was achieved or until further elaboration destroyed the composition. These “chance” compositions were exploited with a fully conscious purpose. 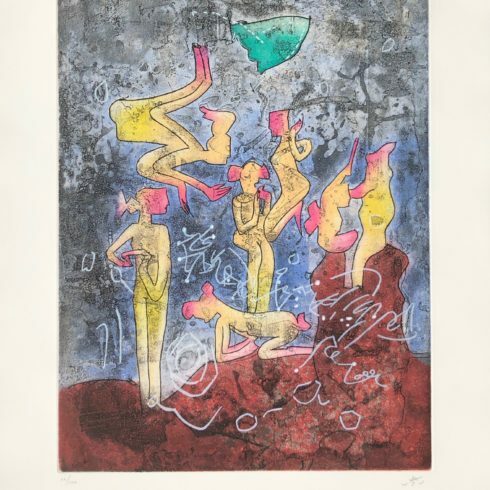 As a Chilean painter, printmaker and draftsman, Matta left Chile as a young man and did not like to be thought of as a “Latin American” artist. 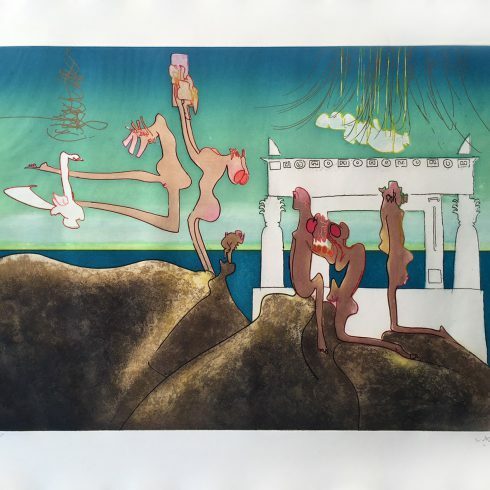 He was certainly one of the few Surrealist artists to take on political, social, and spiritual themes directly and without abandoning the biomorphic mutations he was known for and without resorting to social realism. Matta died in Civitavecchia, Italy on November 23, 2002.